More than one third of all college students in the United States transfer before earning their degree. Among those who do transfer, almost half — 44 percent — switch schools more than once, according to a 2015 report by the National Student Clearinghouse Research Center. Although at least 1.3 million college students transfer each year, there have been few resources to help guide them through the process. 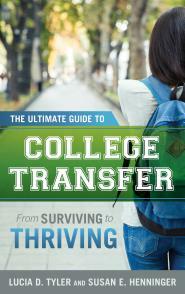 But that has now changed with the publication of The Ultimate Guide to College Transfer: From Surviving to Thriving, by Lucia D. Tyler and Susan E. Henninger. Tyler, a college admissions counselor in Ithaca, N.Y., decided to write the book after she was counseling college students who wanted to transfer back in 2007. "There were hardly any guides available, and what was available was about the process of transferring from a community college to a four-year college," Tyler says. Over the a five-year period, Tyler and Henninger, an Ithaca freelance writer, interviewed more than 100 former transfer students, parents, and college administrators about their experiences with the transfer process. What they found was that in some cases, students can take steps to adjust to their first college, while in other cases, it is better if they start fresh at a new school. Hooray! You just got accepted to Harvard and they have invited you to an accepted students day open house. Uh-oh---that is a day that you promised to work at your restaurant job and nobody else is available. Should you visit on another day? Absolutely. What are the Pros and Cons of going during an Open House. Over one third of college students are transferring each year. Clearly, community college students must transfer to get a bachelor's degree but many students are moving from one four year college to another. Why is that? Standardized test scores are a key part of the college application process. But how should students decide whether to take the SAT or the ACT? To help choose between these two tests, students should become familiar with the differences between them. They should also take some practice SAT and ACT tests to see whether they score better on one or the other. The word affordable means something different to each family so I like to talk about actions families can take to make college more affordable. Parents and students need to commit time, energy, and travel money in order to end up with affordable college options at the end of the process. As the kids head back to school, the stress of the college application process isn’t far behind. The costs and complexities of college today have some parents turning to educational consultants for help.